It may be obvious enough for some people but for those who aren't up-to-date on every latest invention to hit the market, you may not be familiar with some of the new wireless hard drives that are slated to hit the market this year. People all over Canada and America are getting ready to see all of the ways this invention will revolutionize the IT industry. Where once a person would have to look for Toronto self storage to keep all of their electronics and devices can now carry it all directly in the palm of our hand. We're becoming an increasingly mobile society and these wireless devices promise only to increase this trend. 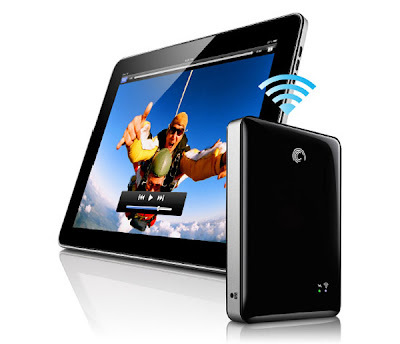 At its most basic level, a wireless hard drive is a hard disc drive that allows users to connect to it from any device by using a wireless connection. This has become an increasingly popular option for areas of the market where people are forced to deal with limited storage space, like phones. With this invention, you'd be able to connect to a wireless hard drive much the same way a person would connect to their modem or router to get Internet access but this is where the similarities stop. Seagate is a technology company that has created a portable hard drive that boasts an astounding 500GB of space. The Seagate GoFlex Satellite hasn't even hit the stores yet and won't be released until July later this year but that hasn't stopped the online world from reporting on its multiple applications. It will primarily be used for mobile/wireless devices for supplemental storage purposes but this device could be a huge game changer. Mobile devices, like the Android and iPhone, can do amazing things that no one thought possible but its storage capacity has been somewhat limited. Though incremental improvements have been made in current cell phones, these new wireless devices could essentially make your mobile device a walking computer in the palm of your hand. This system offers the ability for users to stream video up to five hours, expanded battery life, and the option to serve up to three devices simultaneously. Many devices similar to this are likely to hit the market in coming years and produce huge leaps forward in the mobile computing community. The possibly exists that, in the near future, people will be able to carry every piece of information about themselves while staying connected and all from a hand held device. With this additional storage option, it will be interesting to see what further innovations in application and software development will occur as a direct result from unencumbered computing power.